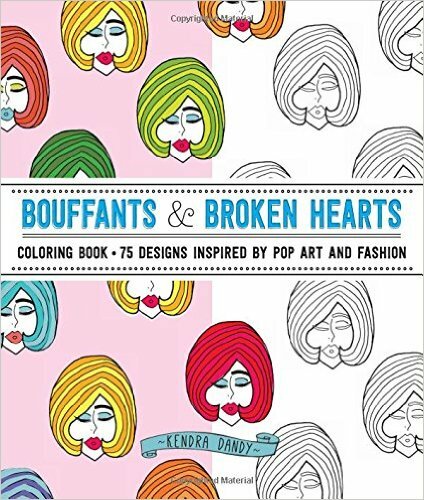 If you are a frequent reader of this blog or follow me on Instagram, you know that I love adult coloring books (come to think of it, for the past several years, I’ve bought a new one for myself on my birthday). They’re a great stress reliever and a good activity to do in front of the tv or with the kids (I share!). 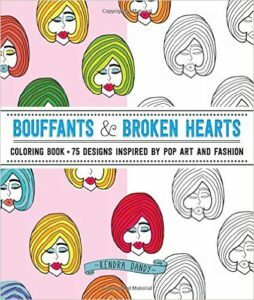 One of my latest acquisitions is Bouffants & Broken Hearts – a quirky, pop art book filled with 70 pages of fashion, food, and, of course, bouffants. You may recognize the distinct style from the artist Kendra Dandy who has collaborated with retailers such as Anthropologie and has her own fabric line printed by Robert Kaufman. So what are you waiting for? Grab your colored pencils and get to work! This entry was posted in Uncategorized on September 30, 2016 by stacy. This may be the cutest project I’ve seen this week – GIANT crayons. I love how they tie in with a popular children’s book series. Love pencils better? This adorable pencil shaped pencil case isn’t just huge, it has great details (I may keep this in mind for teacher gifts this Christmas and stuff them with goodies!). Get your sewing room ready for Halloween with these fun zombie pincushions. Who doesn’t love donuts? This one is giant and calorie free (and makes an adorable pillow)! Making your own cloth napkins not only reduces waste, but they look great and easier to mae than what you’d expect! Not sure how to store extra rolls of toilet paper? 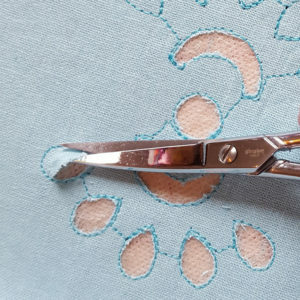 Sew up a handy fabric holder. Skip those plastic tortilla warmers, now you can sew your own! Fall is in the air, keep the chill off little one’s heads with this cute Baby Bunny Beanie (say that 5x real fast!). Learn how to make a trendy, crushed velvet dress that’s perfect for fall. This entry was posted in Uncategorized on September 29, 2016 by stacy. With all the ‘secret sewing’ that I’ve been doing, I don’t have a lot of personal projects to show at the moment. So, instead, let’s talk about all the new books coming out! 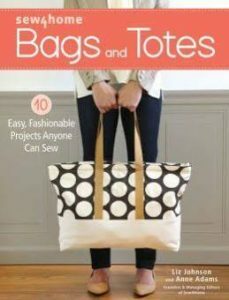 First up, one of my favorite websites Sew4Home is releasing their first title, Bags and Totes. This book contains 10 different sizes and styles of carryalls – from a pretty bow clutch and a vintage book bag (probably my favorite of the group) to a trendy cinch-top bag (also a favorite) and yoga mat sling bag. I’ve always loved the bags that they’ve featured on their site and this book is no exception (I am guessing that several of these may have appeared on their site at one time and have since been taken down because they are published). Best of all, all the projects included in this title are considered easy to sew making it great for beginners and\or a quicker project for more advanced seamstresses). The instructions are detailed and there are plenty of illustrations to help you complete your finished tote – plus there’s a section that deals with closures\hardware and basic tips and techniques. One warning though, there are also no pattern pieces included in this book so be sure to get those rotary cutters and rulers ready to measure! FYI – there is also an e-book available of this title and is currently on sale at the Interweave store. This entry was posted in Uncategorized on September 27, 2016 by stacy. I glitch in WordPress last week kept me from being able to post on Friday. So now that everything seems to be operating normally, I can finally show you another sneak peek at what I’ve been working on….. cutwork! I did a lot of playing around with design combinations, etc. until I got the ones that I liked and so far the results have been a lot of fun….. I just wish there were more ‘open’ areas in some of the ones that I’m working on. Since I’m on a roll with cutwork, I may eventually pick up the Rose & Bone embroidery design and use it for something Halloweenish, but since I have more ideas than time, we’ll see if that happens soon! In the mean time, I picked up a rhinestone zipper and need it shortened. I managed to find one video on how to do this, but didn’t know if anyone out there had experience themselves shortening one? This entry was posted in Uncategorized on September 26, 2016 by stacy. 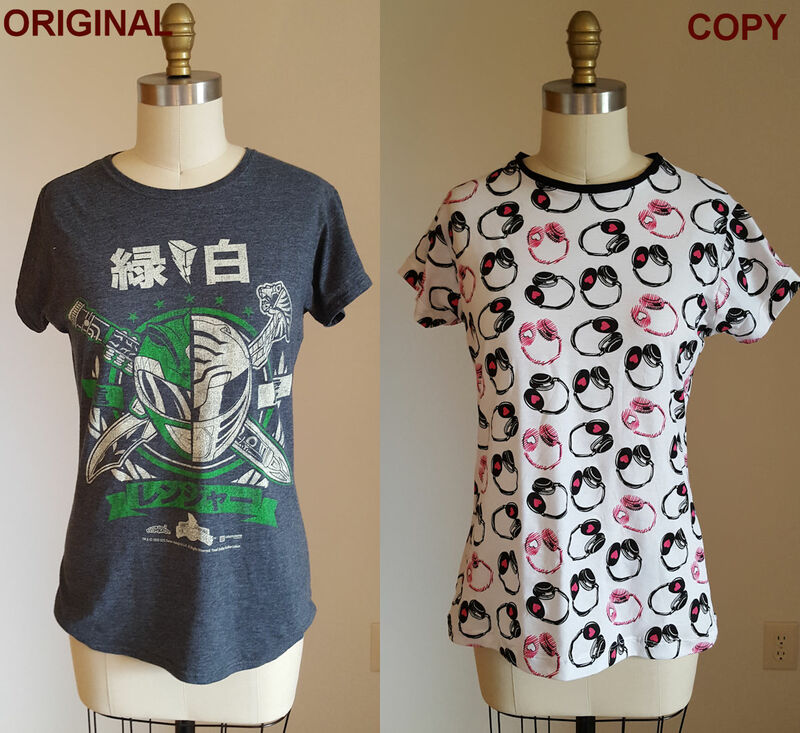 In case you missed the announcement yesterday, I have a new tutorial up at WeAllSew for copying your favorite tee-shirt (plus tips on working with knit fabrics). Emmaline Bags released a new, free pattern yesterday – Miss Maggie’s Handbag. A great way to showcase bold prints and fancy hardware! Maxi cardigans\vests are a hot look this season. Learn how to make this trendy coverup with this easy tutorial (I love the sheer back to this one too). These clear vinyl pouches are perfect for stashing makeup, tools, and school supplies and allow you to see what’s inside. It’s officially fall, which means it’s time to start decorating for the new season. Why not whip up a few of these fun pumpkin stacks? I don’t have a piano, but I love how pretty this patchwork cushion brightens up a room. If you’re not making your own jeans, chances are you may have gap-osis in the waist…. learn how to fix this problem so you have the perfect fitting jeans. The Christopher Bag is a cute look for fall and I love the ‘rain slicker latch’ closures. Tired of waiting for potatoes to cook in the oven? Make a few of these microwave potato bags and you’ll have your spuds in minutes. Join the iThinkSew website and get the Yoana Clutch for free. Could this stubby squid be any cuter? This entry was posted in Uncategorized on September 22, 2016 by stacy. You didn’t have to wait long…. the teaser I showed you on Monday is LIVE today on WeAllSew! Now you can learn how to copy your favorite tee to make a whole wardrobe of your favorite shirt. Not only will you learn how to trace a pattern without taking the original shirt apart, but there’s lots of knit tips included too. It’s easier than you think! Plus you can get started by using items you have around the house (skip the tracing cloth, wax paper is the way to go). Have fun and be sure to show me pictures of your new tees! This entry was posted in Uncategorized on September 21, 2016 by stacy. It’s been quite some time since I’ve worked with a pattern magazine, but I recently received the Fall\Winter 16\17 issue of My Image magazine in the mail and may just have to get started using them again! 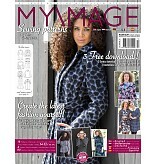 This issue included 16 different styles ranging is size from xs-3xl (plus the link to 3 different, digital PDF patterns for a dress, trousers, and purse): 5 dresses (including one that can also be made into a top and a shirt style blouse dress), 2 skirts, 3 Jackets\coats\cardigans, 4 tops\sweaters, and 2 pairs of pants. You can scroll through all the designs included in the issue with this link. All the pattern pieces are included in the magazine and need to be traced off before cutting into your fabric – it’s important to note that, like other pattern magazines, seam allowances are not included! 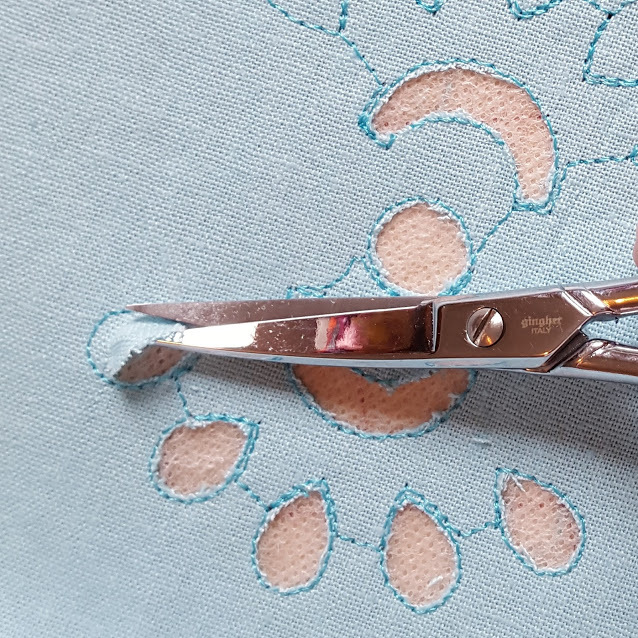 The instructions are straightforward and come in English, Dutch, German, French and Spanish and there are very few illustrations included – something to keep in mind if you’re a new seamstress. Although they aren’t rated, patterns look to range in difficulty of beginner to more advanced. 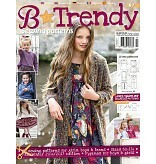 The company was also nice enough to ship me a copy of their latest B Trendy issue as well – a magazine devoted to kids sewing. Included in this issue are 20 different looks for boys, girls and teens and are sized for 9\12month olds to around 13 (there are also 3 digital patterns that you can pick up for free for a vest, tunic, and purse). I may have to give this one a try as well – there were several things that were sized for Easton that I think he might like. If you plan on picking up either of these issues (or both) be sure to use the coupon code STACYSEWS at checkout to get 25% off your order! In the mean time, keep an eye out for my version of a few of these patterns in the coming months – eventually it will be fall and I need some new looks! This entry was posted in Uncategorized on September 20, 2016 by stacy. This weekend I spent the bulk of my time putting the finishing touches on another behind the scenes project – this one for BERNINA’s WeAllSew website. This project was a bit more time consuming to work on since it required lots of photos (and lots of ‘editing’) and is definitely more detailed than some of my other recent tutorials….. but I think you’re going to love it! The hardest part of this project? Narrowing down my fabric choices! In the end, I decided to use something less conventional – this fun headphone print that I’ve been stashing for quite some time. This entry was posted in Uncategorized on September 19, 2016 by stacy. Sew Sweetness bags are always so well designed and now you can try out one for free with this Kennedy Bag pattern. Speaking of Sew Sweetness, did you notice Sara’s awesome new Tula tattoo? Homecoming is right around the corner which means it’s time for MUMS (while they aren’t popular here, I lived in Texas and they are a big deal). Learn how to make your own (or just check out how big they really are) here. Create a different kind of kimono with this knotted front design. 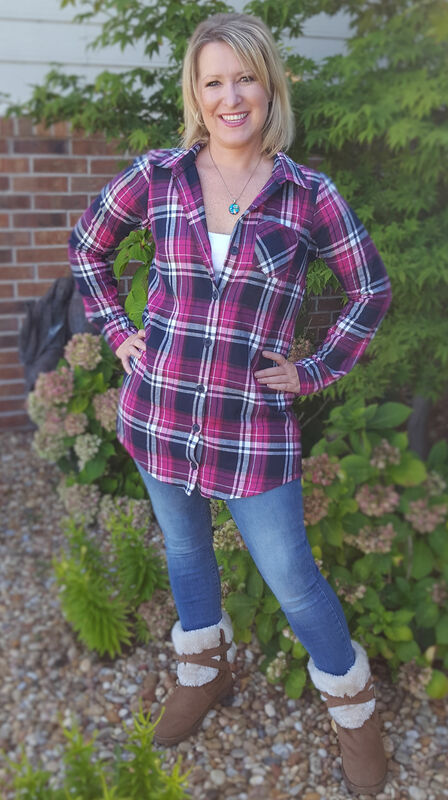 Everyone needs a great basic shirt pattern like this v-neck version from Melly Sews. This convertible bodysuit starts with a purchased pair of underwear and 2 yards of fabric. Clever! Pumpkin Spice Lattes are back and I feel an (occasional) chill in the air. So why not whip up a new fall skirt? A sweet little dress for girls that’s perfect for charity sewing. Not only is the Play All Day dress quick to sew, it doesn’t use much fabric either. Stop buying clip-on purse handles from retailers. Learn how to make your own, instead. If you buy a few extra swivel clips when your shopping for your handle hardware, you can use them to make matching luggage tags as well. Taking the clutter off your desk, learn how to organize your office or sewing room with this handy wall pocket organizer tutorial by Nancy Zieman. Show everyone your love for fall by sewing this Fall Applique Pillow. Novelty pillows are always a fun addition to any room, like this giant ice cream cone. Looking for a quick bag to make to head out this weekend? Be sure to check out this tutorial for a drawstring bag with ribbon (or cording) ties. Need a maxi dress that isn’t a tank? Be sure to check out this kimono sleeve version instead. This entry was posted in Uncategorized on September 16, 2016 by stacy. It seems like, as of late, Thursdays have been the day designers choose to release the patterns that I have been testing…. Consequently, instead of Linky Thursday (don’t worry, I’m saving that post for tomorrow! ), I’m finally able to show you one of my ‘behind the scenes projects’, the Oakley Button Up! This is a great fall wardrobe builder type pattern for a button-up style shirt with some subtle shaping (it’s not a boxy cut and even has bust darts! ), long and short sleeves, and two lengths – tunic and ‘regular’. I recently tested the long sleeve, tunic-length pattern (in a size Medium) and was really pleased at how well it came together (even in the testing phase, I didn’t find that it needed any changes for my size). Since I was going for the longer length, I opted for a thinner material that had some drape to prevent looking ‘bulky’ – a pretty fabric, but it was a booger to work with (not only does it easily slide off grain, but some areas like the pocket required lots of extra interfacing to keep it’s shape). As for the fit, I’m happy with the Oakley Button Up looks on me – I have broad shoulders and the medium seems to fit right about where it should without alterations and it has a nice shape so that you know you’re wearing a women’s top, but still has a relaxed feel to it. Overall, I think that an advanced beginner could probably manage this pattern without too much difficulty so long as they were comfortable with buttonholes and marking their placement themselves. The Oakley Button-up is on sale today only, so snag yours at the discounted price before it’s too late! This entry was posted in Uncategorized on September 15, 2016 by stacy.